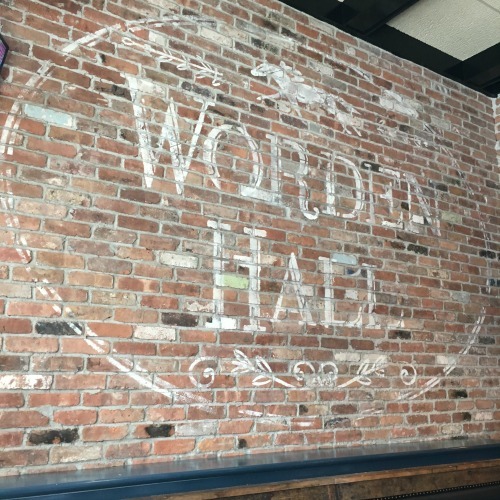 Worden Hall in South Boston, a.k.a. 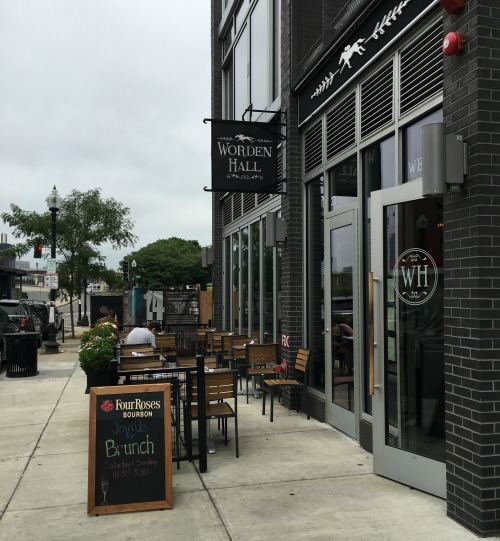 Southie, offers a true brunch menu on Saturday and Sunday. My friend Sara and I were invited to check it out this past weekend. 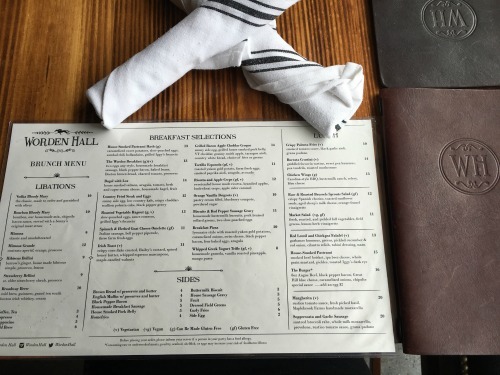 I love breakfast and she loves lunch, so Worden Hall's brunch menu that splits items by Breakfast and Lunch was perfect for us. I started out with a Bloody Mary (necessary after a night out on Friday). 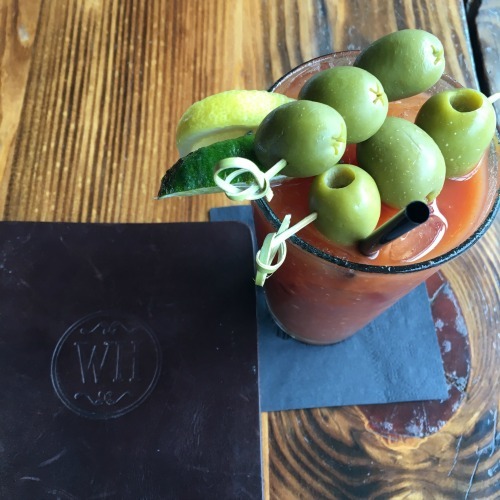 With my usual request of extras spicy & extra olives, Worden Hall's bartender did not disappoint. Look at all those olives! To follow what I stated above, I got breakfast and Sara got lunch. 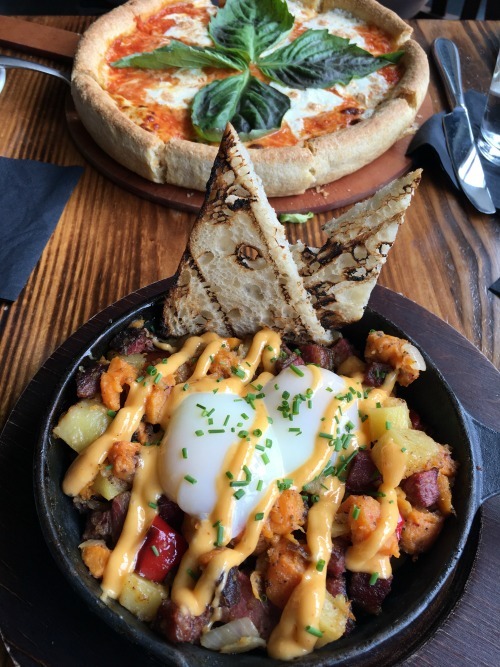 My choice was the house-smoked pastrami hash with carmelized potatoes, 2 poached eggs, chili hollandaise, and grilled bread. The pastrami had a good smoke and I loved the hollandaise. Dipping the grilled bread in the runny yolk? Sooooo. Good. I wish the potatoes were a bit more crispy, but I did very much enjoy the mix of regular & sweet. Sara got the deep dish margarita pizza which she said hit the spot. I liked the presentation with the large basil leaves. I also started with a raw & roasted brussels sprouts salad which was so yummy and fresh. 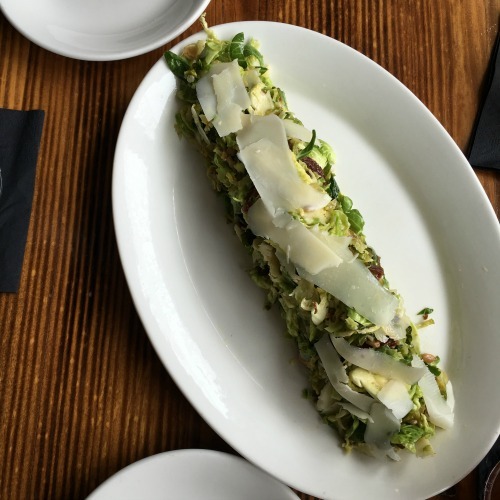 The texture mix of the raw & cooked brussels with salty chorizo, sunflowers and shaved parmesan was perfect. Our waitress was very friendly and attentive. Pricing was fair and portions good-sized. Check out their outdoor space too! Thanks, Worden Hall, we will back back! Disclaimer: We were comped our meal for this review. Post idea and opinions are my own. All photos by me. So yummy! I got invited to check this out too and I need to find a time to go - especially after seeing your pics!